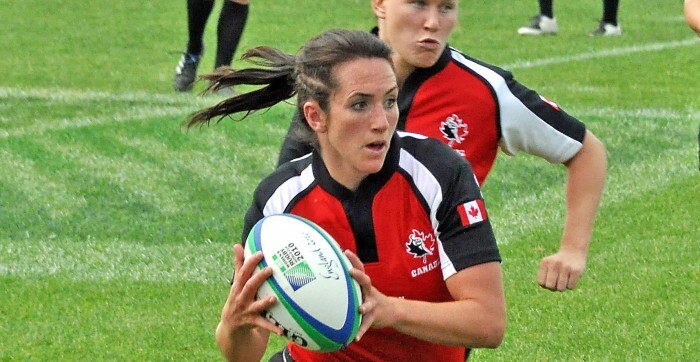 This week we caught up with Canadian 15s and 7s star Barbara Mervin, who has set up her own company APTOELLA, which makes rugby clothing especially for women. She tells us about her playing career and her business. Tell us first about your rugby career to date, when you started playing and how you reached the top? My gymnastics career ended at the age of 16 and I was searching for a way to fill all of my spare time, heaven forbid I get a job. As a tomboy growing up, the majority of my friends were guys and through them I was introduced to rugby. I thought it looked interesting so I went out and joined the local rugby club. It was love at first tackle. I couldn't believe how inclusive everyone was and how many things I got to do that weren't considered foul play. Coming from a sport where perfection was sought after and very rarely attained to a sport where nothing would ever be perfect was empowering and a bit of a relief. After learning the basics with the Peterborough Pagan's Rugby Club, I went on to play four years with the Mustangs at the University of Western Ontario. It was during these years that I knew I wanted to play for Canada. A significant point in my career was when my University team toured to New Zealand. Playing in NZ and losing to teams by +80 points was a huge wake up call. The parties were terrific, but the games were pathetic. While there I met some of NZ's greats: Anna Richards, who ran a skills session with us, and Amiria Marsh, with whom I billeted. I later earned my fist cap playing against both of them at the Churchill Cup in 2005. Since 2005 I've earned twenty-one 15s caps and seven 7s caps. I have spent ten years with the National Team, including age grade, and I know every year in the programme has helped shape me into the person I am today. Where did the idea for APTOELLA come about? I always found rugby clothing very unflattering and uncomfortable. I believe when you make a team you should be proud to wear your team's apparel and the team apparel should make you look good. It was typical that when I would receive five items of kit I would maybe like one or two of them. I think players do not complain because they assume the gear is free or highly discounted when, in fact, it rarely is. Players are generally paying for kit whether it be through season dues or fundraising efforts. I knew I wanted to make a company that had woman's best interest at heart. APTOELLA's vision is to inspire, celebrate and empower female athletes around the world. That is how we hope to measure success and why APTOELLA jumped on board when Scrum Queens asked if we would be interested in sponsoring prizes for the 2013 award winners. Tell us how you set it up? I knew I wanted to start this great company but I had no idea about the industry so I went to school and got my diploma in fashion design. Meanwhile I was preparing for the 2010 World Cup with the national team. Once I had the skills, I started making shoulder pads from home. It worked out well because I would train during the day and sew in the evening. When I first started out, making one set of Attack-Her shoulder pads could take me weeks to produce. Thankfully, my first sales were mainly to my teammates so I didn't have any major deadlines. Currently, I have industrial machinery and the process has greatly improved, as has the quality of the protective garment. I remember the day when I got the IRB approval tag for the Attack-Her, it felt similar to wearing the Canadian jersey. I sat in my sewing room and cried happy tears. I was so proud that I was able to make something that could actually help female rugby players. You have an experienced female rugby player designing products for female rugby players. I have played in the dry deserts of Vegas and Dubai; through the thickness of Hong Kong's air; drenched in UK rain storms; and on the frozen snowy ground of Canadian pitches. I design products that can stand the weather and that fit and flatter female athletes. After a grade three shoulder separation I learnt about the limited and ill fitting protective available on the market for women. I know what it is like to be an injured player and the depression that can come with it. Injuries are part of the game and the Attack-Her can help decrease their occurrence and their severity. We also hope that athletes can return to play safely and with more confidence when wearing APTOELLA products. Another major difference is that empowering women is at the forefront of every decision and design. Making women happy, comfortable, confident and enhancing their performance is what this company is all about. Women are not an afterthought. Furthermore I believe the women that get to wear APTOELLA apparel and experience the joy of playing rugby are privileged. I am one of these women, and with privilege comes responsibility. That's why I have made it APTOELLA's ethical duty to support as many women as possible, including the women that help make our fabulous products. It is for these ethical reasons and product standards that APTEOLLA apparel is manufactured in Canada. Exceptionally well, and I have many amazing women in my life to thank. You often hear that in the corporate world men help men, but women do not help women. I have not found this to be the case at all. I owe the growing success to all my Canadian teammates, Canadian female coaches, and women high up in the corporate rugby world. Susan Carty of IRB emailed me this morning about purchasing shorts and helping me get in contact with the head honchos for next years 15s World Cup. Erin Kennedy of USA Rugby's Try On Rugby programme has helped me get in contact with USA Vegas 7s and as a result in contact with World Rugby Shop. If rugby women are cut from a different cloth, then it is the finest of all fabrics.